Make Something Today, Even if it’s a Mistake! Ampersand Panels are VERY Forgiving! There are lots of reasons to love Ampersand panels. For example, they are archival, eco-friendly and formaldehyde-free. They can hold heavy applications of paint without the “bounce” of canvas. Colors are truer and brighter. You have enhanced control. Patricia Isaac is a life long artist and taught for many years in Massachusetts before settling into work as a full time artist in her favorite medium: oil pastel. 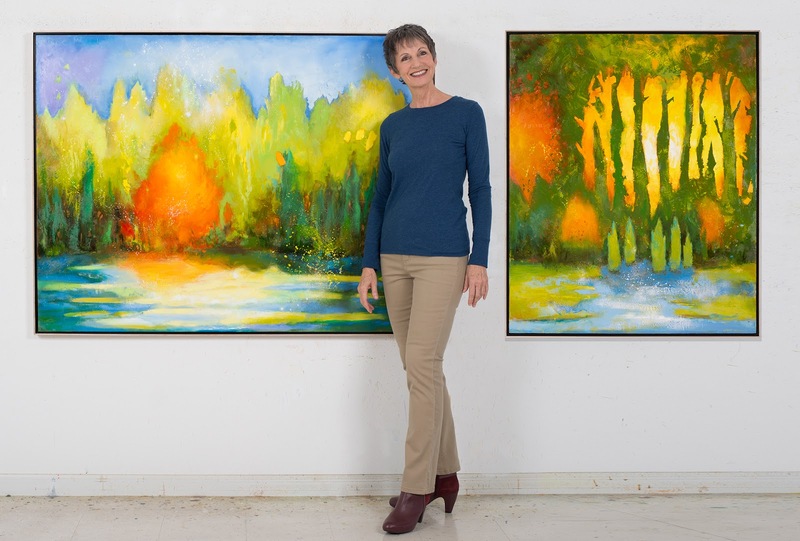 She is a founding member of the Oil Pastel Society and nationally recognized for her work. Patricia shares how she came to find Ampersand and why it is a favorite material for her work. Patricia can be found online at her website and blog and her work at the ET Wright Building in Rockland, MA. Click here to explore the full selection of Ampersand panels and tools. 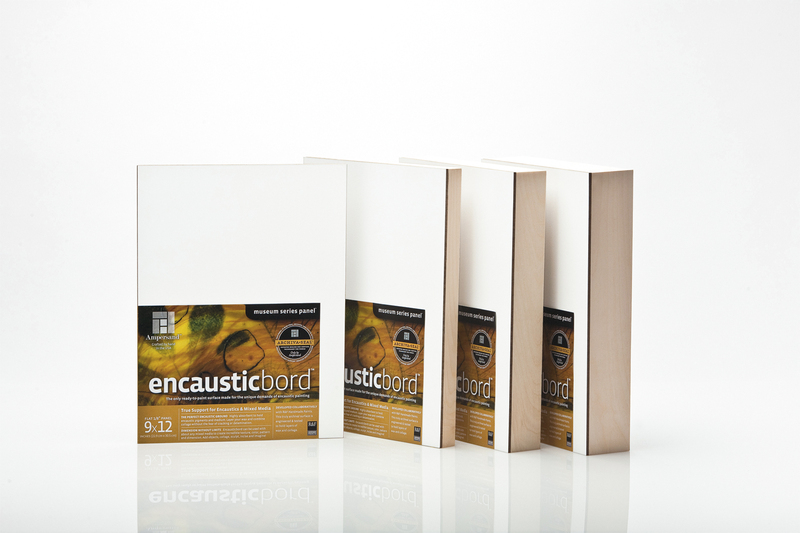 Encaustic is a beeswax-based painting medium that is worked with heat. 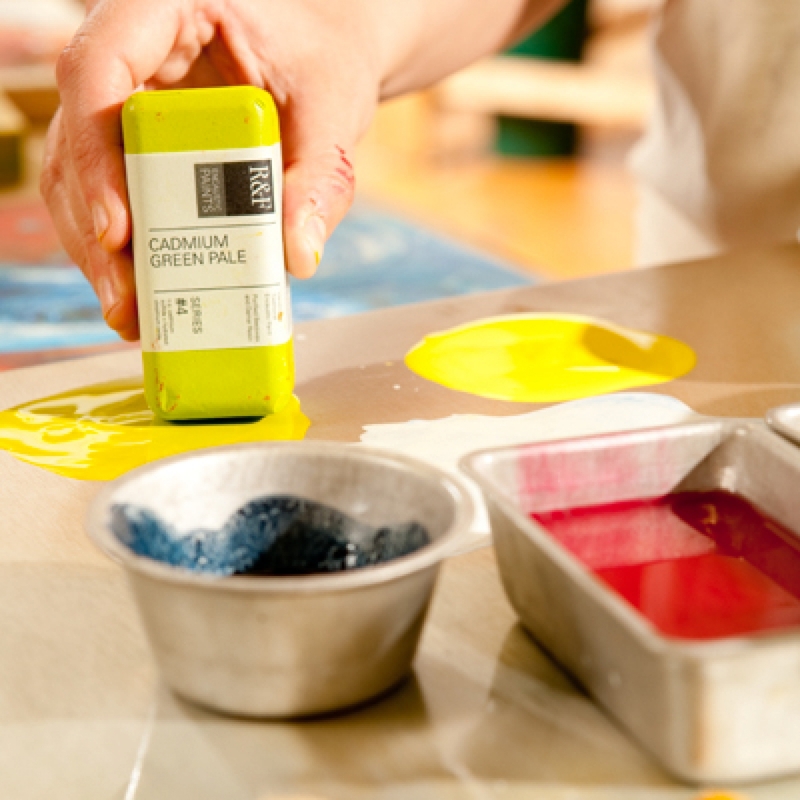 Painting with encaustic is a multi-step process. First, the paint must be melted, or liquefied. Next, the molten paint is applied to a porous surface. Then the applied wax is reheated, or fused into, the working surface, allowing it to form a good bond. As a final option, the cooled paint can be buffed to bring up the luster of the wax and resin. • You will need a clean level counter or worktable to put a heated palette on. When setting up your worktable take into consideration the space that your palette will occupy and give yourself extra room for additional materials, like heat gun and works in progress. • You will want to make sure that your work area has proper ventilation. Exhaust fans in windows, cross-ventilation, or a studio ventilation system are all good options. It is important that you have a source of fresh air in your workspace. Though not unpleasant to smell, wax fumes should be treated like solvent fumes. A well-placed window fan should be adequate for a small set-up. • It will be imperative that you have adequate electrical outlets available for use. Consider that you will have a palette, possibly a heat gun and/or other tools that will require electricity and it will be helpful to position your workspace accordingly. • Keep in mind that anytime you use heated tools/equipment it is recommended that you have a burn kit and a fire extinguisher on-hand for safety purposes. Heated Palette: The heated palette is an essential tool to the encaustic artist. It provides a surface to heat and mix encaustic paint and medium on. Less expensive alternatives to purchasing a custom palette include electric skillets, crock-pots or electric griddles. Regardless of the palette you select, it is important that it be equipped with temperature controls. Palette Surface Thermometer: It is crucial to be able to monitor the surface temperature of your palette. A surface thermometer can easily assist you in monitoring the temperature of your palette (the safe working temperature for encaustic paint ranges from 180-200°F). Brushes: Use natural bristle brushes only; synthetic brushes can burn and melt on the palette. Mark Making Tools: Any type of mark-making tool will work with encaustic paint. We recommend etching, wood carving dental, sculpture, and clay working tools. Soy or Paraffin Wax: There are two options for clean-up, either Soy or Paraffin wax. We recommend using soy wax for clean-up because soybeans are a renewable resource, while paraffin is a petroleum based product. An additional benefit to using soy wax is that it can be washed off with soap and water leaving brushes supple. Palette Cups: Great for keeping melted waxes separate on your palette. R&F carries heavy aluminum and steel alloy rectangular palette cups in two sizes (sm/lg) to fit 40 ml and 104 ml cakes. Encaustic Paints: There really is no general recommendation for a starter palette of colors, since different artists have individual preferences, but we recommend that you choose a good balance of opaque and transparent colors. Try starting with a red, yellow and blue, and build from there. This post taken from content on the R+F Handmade Paints website. Where does Encaustic Wax come from and how is it standardized for artist use? Beeswax is secreted by wax glands in the bee’s abdominal area and used to create the honeycombs of the hive. Pure beeswax is composed solely of carbon, hydrogen, and oxygen. Its natural color when it is secreted is white. When beeswax is harvested from the hive it is often contaminated with impurities, which discolor it. At this stage it is called unrefined or crude beeswax. Unrefined or crude beeswax is colored in a range of earthy hues from yellow to black. This coloration is caused by pollen, propolis (resin), and dirt. If you use unrefined wax for its color, it is important not to assume that the color is permanent because the color is organic matter, which is not necessarily stable in light and is subject to fading, darkening, or a color shift. These are reasons why you would most likely want to use decolorized, white beeswax for encaustic. You may wonder how does the wax get whitened? Artist manufacturers avoid the term ”bleached beeswax” because it implies the use of chemical bleaches. But the wax industry uses the term for the mechanical as well as the chemical methods of decolorizing beeswax. Chemical bleaching is not the best choice for artists for two reasons. For one, chemical bleaching (which uses either potassium permangenate & phosphoric acid or sulfuric acid or various peroxides) does not always mean removing the colorant. In many cases it simply masks it. It is often used to whiten colorants that non-chemical bleaching can’t, but these colorants can later return to their original color. Furthermore, chemical bleaching can be harsh on the wax, creating free fatty acids and making the wax more reactive to pigments and pollutants. Sun bleaching exposes the wax to the ultraviolet light of the sun, which breaks down the colorants. This is a gentle and effective method of decolorizing the wax. The process, however, is expensive on an industrial scale because it requires so much space, but it is also the most accessible method for artists who want to bleach their own wax on a small scale. Filtration is a process in which the wax is forced under high pressure through filters of activated carbon and clay that absorb the colorants and take out all foreign matter. Filtration is preferable to chemical bleaching because it maintains the structural integrity of the wax. It is also, in the long run, the least expensive and the most practical of the three methods. It is the best choice for artist material. Pharmaceutical grade beeswax is a standard set by the government that certifies that the wax meets certain chemical requirements and that it is pure beeswax. The chemical standards (such as its ability to be saponified) are of importance to the cosmetic and pharmaceutical use of beeswax. For the artist, the real importance of pharmaceutical grade beeswax is that it is a guarantee that the beeswax has not been adulterated with other waxes (such as paraffin or microcrystalline), rosins, stearic acid, or tallow. However, the term pharmaceutical grade does not refer to the method by which it has been decolorized. Artists should seek out wax that is both guaranteed 100% beeswax and filtered or sun bleached. And, in case you’re wondering, R&F uses only pharmaceutical grade filtered beeswax. Taken from the Encaustic Resource Center and written by R&F Handmade Paints. Florida artist Leslie Neumann, knew as a young child she was an artist, remembering drawing when she was two and three. During her freshmen college year, in the midst of family tragedy when she lost her only sibling in an automobile accident, she found herself committing to fine art full time. Reinventing herself, she transferred to the California College of Art to receive her BFA and later moved to NYU for her MFA. 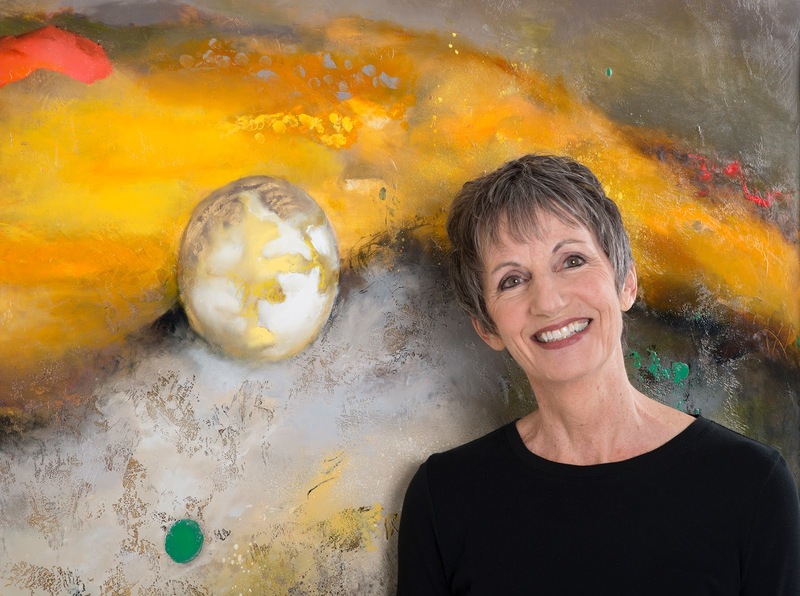 After years of living and teaching in New York, St. John’s University in Queens, Leslie moved to the Gulf of Mexico in Florida to work full time as a painter and active environmentalist. 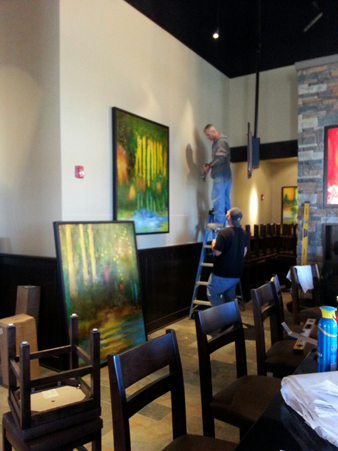 Besides the numerous corporate and private collections around the country, Leslie’s work can be found in Firebird restaurants around the country as she was commissioned from the national chain’s opening to create original work for each location. You can also find Leslie online at her website, to see more of her collection and videos of her philosophy.